Netherlandish painter, active in France. The son of Ydria Exters d Allemagne (d 1460) and the stepson of Pierre du Billant, he is first recorded on 19 February 1444 as a witness with Enguerrand Charonton in Aix-en-Provence and described as magister Bartolomeus de Ayck pictor , inhabitant of Aix. From c. 1447 he was peintre et varlet de chambre at the court of Ren I, King of Naples (reg 1438-42) and Duke of Anjou (reg 1434-80). Between 1447 and 1449 Barthlemy worked at Ren s chteau of Tarascon (Bouches-du-Rhône) in a room close to the Duke s own apartments. There his activities may have included supervising fellow artists, providing designs and perhaps painting the ceiling decoration of the Royal Apartments in the east wing of the chteau (de Mrindol). 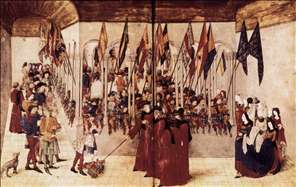 In 1451 Barthlemy travelled in the Duke s entourage to Guyenne, and in 1456 he was at Angers, which he visited on a number of other occasions. Existing accounts show that Barthlemy was responsible for paying painters and illuminators, purchasing materials for manuscripts and obtaining gold to be made into jewellery for Ren s second wife, Joanna of Laval. The last document relating to Barthlemy is dated 26 December 1469, when he received wages for himself, three servants and three horses. The high esteem in which he was held may be deduced from Jean Plerin s third edition of his treatise De artificiali perspectiva (Toul, 1521), which ends with a French poem mentioning a Berthelemi together with Jean Fouquet, Jean Poyet and Coppin Delf. 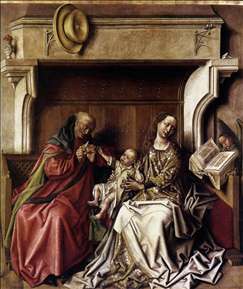 There are attempts to identify Barthlemy d Eyck with the Master of the Aix Annunciation. See more details about "Presentation of Flags and Helms"